During the era of Mali's first President, Modibo Keita (1960-1968), the government created regional orchestras and arts troupes in each of the nation's seven regions. These groups were state-sponsored and from 1962 they competed in annual arts festivals known as the "Semaines Nationale de la Jeunesse" - or "National Youth Weeks". In 1968 a military coup ousted President Keita and the new regime abandoned most of his arts policies, though kept the "Semaines Nationale de la Jeunesse" to appease the public, as the events were very popular. The festivals were renamed as the "Biennale Artistique et Culturelle de la Jeunesse" and were held every two years. The first Biennale was held in 1970, and in that year the prestigious recording label Barenreiter-Musicaphon released a series of recordings of Malian musicians to celebrate the event. Of the seven regional orchestras only recordings by the groups from Bamako, Mopti, Sikasso, Ségou and Kayes were released on LP by Barenreiter-Musicaphon - so what of the groups from Gao and Tombouctou? Where were their LPs? 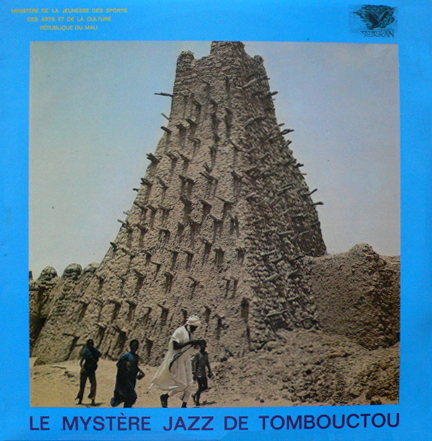 The Orchestre Regional de Gao later recorded three songs on the Malian government's Regard sur le passé à travers le présent and Panorama du Mali LPs, released in 1973, but the Orchestre Regional de Tombouctou, also known as Le Mystère Jazz de Tombouctou, did not release a recording until 1977, when the above LP was issued by the Mali Kunkan label. It is perhaps the rarest release by Mali Kunkan, and in my first trip to Mali in 1994 I endeavoured to find a copy. I was staying in central Bamako at the Hotel du Niger, and nearby was a little bar where I used to escape from the heat. I'd bring in my cassettes of Malian orchestras and ask the bar staff to play them. An older guy was interested in the music and we chatted about Mystère Jazz and he told me that he could get a cassette copy of their recordings. The next day he delivered me cassettes not only of that group but also of the regional orchestras of Gao, Sikasso, and the National Orchestra formation "B", lead by Kassé Mady Diabaté. These rare recordings were probable dubs from reel-to-reels stored in the sound archive at Radio Mali. It is a sad fact that over many years the Radio Mali archives have lost a lot of material, and some high profile West African "producers" have been caught red-handed smuggling tapes out of the country. The cassette copies I received were very muddy in quality and over the years I cleaned them up as best as possible. Years went by and I never found a copy of the Mystère Jazz LP. Recently, however I have been given a CD copy and can review the tracks here. The opening song of the LP is "Leli", and immediately launches into the big brass sound and ostinato lead guitar which readily identify Mystère Jazz's Malian style. The brass and guitar sections are teasers for later solo passages - and what solos they are! Malian music of this period is renown for the quality of the lead guitar solos (e.g. National "A" Orchestra, Super Rail Band, Orchestre Regional de Kayes, Super Djata Band, etc) and Mystère Jazz are right up there with the best. The 2nd track - "Dina waliji" - is a slow tempo number, and is in praise to Allah. Side A closes with "Teiduma", and here the Touareg influence is strongly evident. A great sax solo is also a highlight. Side B opens with "Walé", a song which draws attention to the sacrifices that women make in their daily lives. The Touareg rhythms are again at the fore, somewhat Gnawa-like, with a strong bass line and percussion styles that imitate a qrakeb. "Tarekh" is the next song and is sung in Tamashek. Here Mystère Jazz are at their peak: a drum and sax intro the song and are then joined by the rhythm guitarist, who creates an ostinato melody. The lead guitarist then swoops in to join them and that announce the arrival of the brass section. It's one of the best introductions to a Malian song that one is likely to hear. During the song the lead guitarist continually improvises with flourishes and runs, and the song builds in tension until the arrival of a sax solo, which then segues into the long awaited guitar solo. This explores several octaves and closes with an exquisite melodic phrase. "Apolo" closes the LP, and I'll write more on this song later. Since that first cassette in 1994 I have come across other cassettes by the group. Though not all can be certified as Mystère Jazz songs, for they were bootlegs with no information written on them, I consider them to be genuine recordings by the group. The vocalist is the same, the lead guitarist, too, and it "feels" like the group. Now here is a real mystery: I was sure that the cassette that I was given in Bamako in 1994 was simply a dub of the Mali Kunkan LP. In fact it isn't, and it appears to be from a studio session recorded at the same time. Many tracks from the LP are present but are definitely different versions, and are much better than their LP counterparts in my opinion. There are also completely new songs. I don't usually upload songs to the internet, though on this occasion given the rarity of the recording, the low sound quality of it, and its magnificence, here it is - an alternate version of "Tarekh". The guitar solo is exceptional, the best, and it's one of all time favourite songs. If you have this song in better quality please let me know! I have written extensively on the history of Mali's cultural festivals and cultural policies. For further information on this unique period of modern African history see my publications "The return of Mali’s national arts festival", "Cultural policy and music in Mali", and "Mande popular music and cultural policies in West Africa" in the publications link above.